So, here I am in Jamshedpur, as my sister had broken her knee and needed to be operated on. During the course of helping out around the town, one of the requirements was to take her to the hospital and back. As the wound were still fresh, it meant that I had to drive the car very slowly. As per my knowledge I used to switch on the hazard lights to indicate the same so that I don’t hold up traffic unnecessarily. Here starts the dilemma. Ever since I started using it, I found that either people had no idea why I was using it, or like in some cases people came up and even told me, “bhai sab, apka sara blinker ON hai”. I found it weird and surprising. What blew my top was when I saw someone else zip straight through a crossing with the hazard lights on. I was confused now. I came across my neighbour who had the explanation that you should use the ‘straight’ lights to indicate that you are going straight in a crossing. The explanation hit me flat on my face and I started wondering why someone would use the hazard light in this manner. I was trying to figure where they got this information from? It definitely wasn’t the motor training school. I soon found that most of them learnt the same by seeing others use it. This also highlighted the fact the most people who drive cars are actually not licensed legally. They get touts to get them their licenses’ without any training or tests. I can’t really blame them that they don’t know the basic rules. The administration, namely the traffic police are to blame. I’m not sure if this issue is there in any other cities. I haven’t seen any in the metros but not really sure about the smaller cities. I wonder how one can get this awareness among people regarding basic road rules and vehicle usage. I realized that not much could be done from my end and resorted to putting up print outs declaring that stated, “Patient On Board”. Also called “hazards”, “hazard warning flashers”, “hazard warning lights”, “4-way flashers”, or simply “flashers”. International regulations require vehicles to be equipped with a control which, when activated, flashes the left and right directional signals, front and rear, all at the same time and in phase. This function is meant to indicate a hazard such as a vehicle stopped in or near moving traffic, a disabled vehicle, a vehicle moving substantially slower than the flow of traffic such as a truck climbing a steep grade, or the presence of stopped or slow traffic ahead on a high speed road. Sometimes, they are used in severe fog conditions. 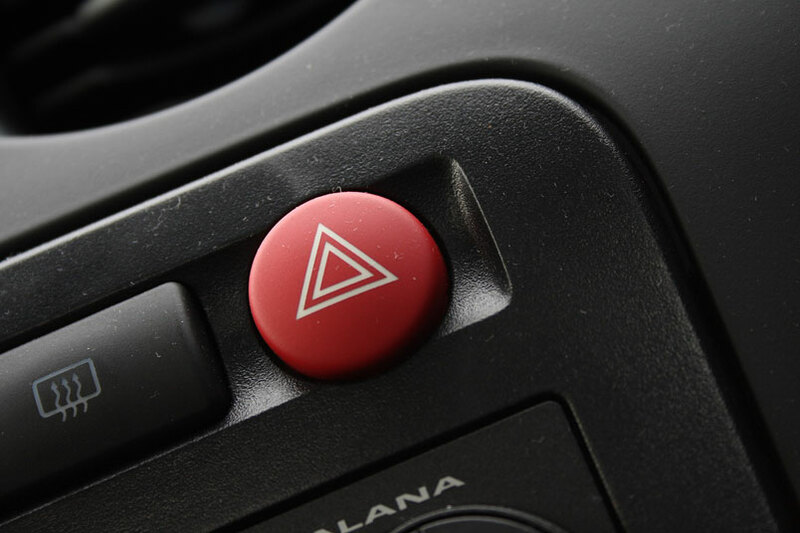 Operation of the hazard flashers must be from a control independent of the turn signal control, and an audiovisual tell-tale must be provided to the driver. In vehicles with a separate left and right green turn signal tell-tale on the dashboard, both left and right indicators may flash to provide visual indication of the hazard flashers’ operation. In vehicles with a single green turn signal tell-tale on the dashboard, a separate red tell-tale must be provided for hazard flasher indication. Because the hazard flasher function operates the vehicle’s left and right turn signals, a left or a right turn signal function cannot be provided while the hazard flashers are operating. Previous PostBumblebee ~ Pulsar 200 NS ~ Calcutta to JamshedpurNext Post20 Reasons Why You Should Date A Biker !!!! !